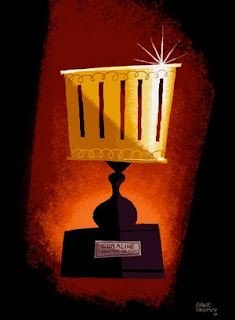 An Annie Award for best character design in an animated feature film for Coraline! Wow! I can not believe all of the kind words and messages since the awards. Thank you so much.It means more than you know. Thank you ASIFA! And on Coraline, Thank you to the inspiring story crew, To the BRILLIANT sculptors and puppet fabricators that brought these designs to fruition, and to the absolutely genius animation team that gave these guys life. THIS TEAM WAS FEARLESS! Thanks Henry Selick!! And I stated it at the awards, and I will say it again. It was an honor to work alongside Shannon Tindle and Dan Krall as a team on Coraline. I have to share this with them. But this award was truly incredible and Very generous on ASIFA's part. Thank you. And It was an honor to be nominated alongside the insanely talented Mr. Daniel Lopez Munoz (UP). Congrats to all!